Hope’s Highway is available in bookstores and with most online booksellers. It’s quite a motley crew for the road: 23-year-old Margie Kinnard and her bitter, mean-spirited father, a loving couple and their blind son, who has ambitions to sing on the radio, a man whose wife will flirt with anything in pants and a rough-hewn rancher delivering his niece to relatives. The cavalcade of characters have two things in common – they’re traveling together by a caravan of trucks on their way to California, and they’re targeted by robbers at a campground and later stalked by a homicidal maniac out to get revenge. 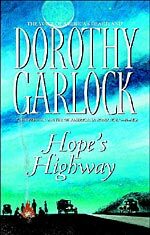 It all happens on “Hope’s Highway ,” the much-anticipated second novel in Dorothy Garlock’s Depression-era trilogy set along Route 66. It is the national bestselling romance author’s 47th book. Margie’s dream of going to Hollywood all but vanishes when a conniving boyfriend abandons her and steals her money. Yet help arrives from an expected source – Margie’s ornery, antagonist father who is headed for the Golden State to start his life anew. On their way from Springfield, Missouri to Gallup, New Mexico, they hook up with the others for companionship and protection, but when one of them ends up dead it’s clear a vicious pair is stalking all of them. A veteran newspaper reporter, Garlock conducts extensive research for her novels and admits to being an avid mystery buff. The mother, grandmother, and great-grandmother also keeps many of her stories alive via recipes from her Old West novels that she posts on her website. In what she calls “food for your imagination,” she presents them just as they were passed among the settlers, and also includes the equivalents of modern measurements. The recipes range from Fried Venison Steak to one of Garlock’s favorites – Everyday Cake from Midnight Blue – and posting them on her webpage is only part of accommodating her readers. Even with more than 20 million books in print, Garlock still answers her e-mail and when readers ask, she listens. Visit Dorothy’s website at: www.dorothygarlock.com.